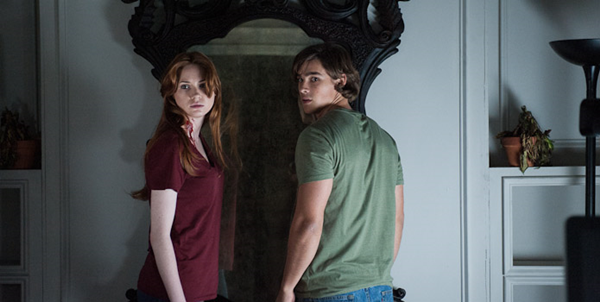 Oculus is the first legitimately great horror film of 2014. It also marks the first genre wide-release since back in February when Devil's Due came out. Unfortunately, not too many people will see this one...which is a damn shame. Now, before I get into this film I would like to talk briefly about Absentia. Writer/director Matt Flanagan crafted such an effective little thriller with his previous effort. I remember discovering the film a couple of years back and championing the little horror film for being such a great example of good independent horror filmmaking. It took some conventional elements of the genre and used it in some really creative ways, creating a genuinely creepy experience all throughout. And, while Absentia had some pacing issues that I ended up forgiving, it was the quiet unease that made the film ultimately work. Oculus uses those same methods to its fullest potential. Flanagan is able to, not only summon lightening twice here...but, he also manages to improve on them. Because this is adapted from one of his short films, it feels like he is able to concentrate on the things that count here. His style is understated, yet powerful with execution. He uses each scene purposefully in which to carve a narrative that truly delivers on its promise. There is no cheap jump scare in this film...not a one. Much like Absentia, this film incorporates as much as possible in order to create something cohesive and true. Flanagan is able to really excel with his sophomore entry into the genre...a rarity in horror. The film basically opens on the night of some horrific events that took place eleven years ago. Something about a father that fucked up some lives of his kids. I don't wanna say too much, because the film is best served not knowing anything about it. In fact, I did my best to stay away from anything that might spoil the film completely for me. I watched the very first trailer...and that was it. I loved Absentia...so, I kind of knew what was in store when I first heard about Oculus. So, because their father fucked these kids up for good, we our introduced to Tim Russell (played convincingly by young actor, Brenton Thwaites), who is spending his final days in a mental institution. With the aid of his doctor, Tim has come to terms with explaining why these certain events took place eleven years ago in a more logical manner. Meanwhile, his sister Kaylie (Doctor Who's Karen Gillian) has held onto the supernatural aspect of what shook their family all those years ago...and has found the very object responsible...the mirror. An old antique mirror that is not unlike an open doorway to all things creepy and awful. From early on, the fact that we have our two protagonists introduced as tortured victims dealing with the horrific events that pretty much shaped their lives in their own ways...is so interesting. One sibling struggling to makes sense of it all...while the other knows exactly what they are dealing with. It introduces a thread common in Flanagan's previous work where the things that we are seeing...might not necessarily be supernatural. Thankfully, this is more a detail than an actual main plot point and Flanagan is able to allow the story to be a breathing horror film on its own terms. While I certainly enjoy ambiguity in my films...I've always been more a fan of the unexplained. Anyway, it's not long before we know what we're dealing with and the film plays out more like a means to determine what really happened eleven years ago, complete with flashbacks. Oculus lives in the quiet moments...always building to its ominous climax, so the story is soaking with atmosphere. If nothing else, Flanagan truly knows how to employ tension into his films. However, there's so much more. The performances are great and really sell the entire thing. Katee Sackhoff and Rory Cochrane really go for broke playing the tortured parents from the flashbacks and help to push the Oculus bus into an emotionally agonizing reality that could exist somewhere. This is a family that was once wholesome and pretty to look at before things went south. And if you look closely, you'll spot Courtney Bell from Absentia making an appearance. In the way of special effects, there's so much to love about this film. All the practical stuff is here to make you wince and grab your fingernail when you see what plays out onscreen. I realize this is a bit far-fetched...but, when you see the little blurb in the advertisements for the film where Stephen King is telling you that you will look at eating an apple differently...he's spot on. I really have no gripes about Oculus. Perhaps one to call out pacing issues and some mellow-dramatic stuff thrown in. Maybe some over-acting here and there...and, perhaps a bit of a predictable conclusion. But, for a film this understated and immersed in real horror, it is something that should be seen and experienced. Unfortunately, it is opening the same week as Rio 2...so, Oculus will, no doubt, get lost in the shuffle. Oculus is a film that needs to be seen and supported. It is the progression of a filmmaker that genuinely gets it and we need films in our genre like this every year. While there was only a handful of people in the theater that I watched the film in, those few left the theater with a dark pit in their collective stomachs. I overheard some saying that it was the "most fucked up thing they've seen in a while". And while that might not necessarily be true for the most jaded horror fans in the audience, Oculus is certainly the most unique genuine horror film that you will see in quite some time.